Welcome! And an Explanation. With tears. Don’t own it yet? Buy your copy here! Canadian Jordan Haines is on vacation in the Caribbean. After the summer he’s had, a couple months of fun in the sun is just what the doctor ordered. What he didn’t count on was meeting a beautiful woman on a private beach – or falling hard. Crown Princess Astrid of San Majoria seems to lead a charmed life. Just like everyone, there’s tragedy in her past, but she lives in a palace, has aides to do everything – and paparazzi hounding her private moments. Her sanctuary on her family’s beach is broken one day when a tired windsurfer takes refuge in her cove – and works his way into her heart. But it’s just a summer fling, isn’t it? After all, Jordan will be returning to Canada before long, won’t he? When pictures of the two of them, and what looks like an engagement ring, appear in the tabloids, they have to deal with fallout – and the beginnings of a real relationship. 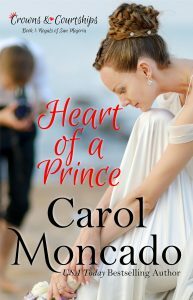 Secrets kept become hearts broken as they try to discover if Jordan really has the heart of a prince. Prologue: Crown Princess Astrid of the Cordovan Dynasty of San Majoria marries the love of her life, Andrei, in a royal wedding. For the next eighteen months, they put their stamp on the royal family. On their way home from an event, their car is broadsided. Astrid survives with only a small scratch, but Andrei is pronounced brain dead the next day. In a difficult decision, Astrid decides to donate his organs. Though her father generally prefers the family to keep a stiff upper lip, he loves Astrid as only a father can as she says goodbye to the love of her life. Canadian Jordan Haines knows his body’s limits, and he’s reached them while wind surfing. Despite warnings about a private beach, he stops at a small cove anyway. Before long, he’s joined by a wealthy, elegant woman who’s having a very bad day. She tells him her name is Sofia and that this is her family’s beach, but refuses to tell him why the day is a difficult one for her. He tells her that he’s visiting her country because his little sister just married his best friend after dating for only a few days. He’s a bit out of sorts and not sure where to go next with his life. Though Astrid’s father and security teams aren’t crazy about a stranger on the beach, she convinces them via text to leave them be. A background check is started. Jordan asks her out, but instead she invites him back to her beach the next day. Two weeks later, they’ve spent several hours a day together most days. This time when Jordan shows up, they take a yacht to an island about forty-five minutes away. While there, they fight a “war” with Islas del Sargasso. Similar to the Whiskey War between Canada and the Dutch/Greenland over Han Island, San Majoria and Islas del Sargasso take turns raising their own flag and leaving tchotchkes for the other country to find. The background check has come back clean, as expected, so they are allowed to spend time alone without the eyes of security on them. She tells him her name isn’t Sofia, but won’t tell him what it really is. They share their first kiss. The next week, Astrid goes to visit a local hospital. She bemoans her beige outfit and wishes she could dress more colorfully. She meets a little boy named Andrei. Andrei’s mother explained that she and the boy’s father shared a wedding day with Astrid, though they married in Ravenzario. Jordan spends a day on the beach where he’s staying, taking his shirt off in public for the first time in a very long time. A kind stranger helps him with sunscreen. A month after they first meet, Astrid and Jordan compare scars – and life stories while spending the day on her beach. Jordan tells her about several of his from his hockey days as well as his last trip to San Majoria – where he found out his heart was failing and spent several months in the hospital until a donor was found. Astrid shows him the small scar on her forehead from the accident and tells him about Andrei. The next day, she asks him to the beach in the morning. It’s the first time they’ve spent more than a couple hours in the afternoon together. There she introduces him to her eighteen-month-old daughter, Sofia. After spending some time with the little girl, they have lunch in a gazebo out of the rain. Back on the beach, he chases her, though a wave catches them both off guard and they fall to the sand, kiss, and get up. The next Monday, pictures of the two of them, as well as him with her daughter and Astrid wearing a ring from her grandmother on her ring finger, appear in the tabloids. Betsy and Dare, Jordan’s sister and best friend/brother-in-law, call him with the news that he’s dating the Crown Princess. Jordan is in denial until security appears at his door and takes him to meet the king – without giving him time to change out of his board shorts or put on shoes. While talking with the king, they realize that Jordan has Andrei’s heart, however, they decide it’s best for Astrid not to know. The engagement becomes official, though Jordan never proposes. The wedding is in just under three weeks. The Monday before the wedding, Astrid has a migraine. Jordan takes Sofia on their first outing together to a turtle sanctuary. The press and people love the two of them together. Tuesday, Jordan’s family arrives from Canada. They spend time together. Jordan tells Dare about his heart. They get married on Saturday, August 27, 2016. Astrid is anxious for the wedding to be over. Jordan notices the strain and pulls her away from the photographer for a few minutes alone. They sleep in the same bed, but nothing more transpires. The next day, they along with Sofia and their assistants go to Eyjania for their honeymoon. Astrid tries to calm a very cranky Sofia and falls asleep on the floor in the nursery. Jordan uses makeshift gear to begin to teach Sofia about hockey. They have dinner with King Benjamin of Eyjania and his sister, Princess Genevieve. It doesn’t go overly well. Things seem to be amiss in Eyjania, with Benjamin’s uncle Isaiah having undo influence. Genevieve complains that Isaiah wants her to marry a man of his choosing, including at least one old enough to be her father. A few days later, Jordan takes Astrid and Sofia to the ice skating rink. He skates with Sofia then Astrid, kissing her before she gets off the ice. He plays a pretend hockey game in his head and San Majoria wins Olympic gold. They return home. Jordan discusses supporting charities with Prince Kensington. They, along with Astrid, attend an event her parents were supposed to have attended. When they return, Astrid is told Sofia is sick. Jordan has a conversation with the queen, who points out he hasn’t slept in the same bed as his wife since their wedding night. She tells him not to give up and turn on the charm. Jordan confronts Astrid about “friend zoning” him. They kiss, but she spends the night with a sick Sofia. Two days later, they attend a carnival for children at the local hospital. Jordan spends time in the dunk tank, and they play games with other kids. He’s quite popular among the people. They spend their first night together before going to spend several days at the house where she’d been when they first met. They kayak in their cove then he takes her parasailing, something she hasn’t done in years because it bothered Andrei. They return to the palace in time for the San Majorian Independence Ball. Jordan gives her a top he thinks she’ll love, but in greens and blues and not the browns she normally wears. Afterward, a comment Jordan makes about craving a certain food, one Andrei loves, leads to the revelation about his heart. They fight. Astrid confronts her parents and kicks Jordan out of her apartment, but makes sure he has his medicine in his new room. Astrid attends a tea. Jordan does a hockey demonstration with the local children’s league. The king sends them to live in another palace on a different island. A few days later, Astrid returns for an event, wearing the shirt Jordan gave her. Her assistant puts colored clip ons in her hair. Everyone loves it. Her grandmother, in a few words, makes Astrid realize her clothing choices stem from comments made by Andrei, not anything her family wanted. Jordan talks with the doctor who did his heart transplant and edits photos of Astrid. He calls the female head of a local photography group for help, and plays hockey with Sofia in her nursery. Astrid talks with her mother who raises a question about when she and Jordan will have a baby. The photographer helps Jordan and Jordan takes pictures of her for practice. Astrid finds them but realizes there’s something lacking in those pictures that she sees in the ones of her and Sofia. She finds him and tells him the truth about Andrei. As far as she knows, Andrei never cheated on her, but she believed it was just a matter of time after Andrei’s “the one that got away” started working at the palace. They go to Ravenzario for Queen Christiana’s wedding to Alexander Bayfield. They spend a little time with King Benjamin and his sister. When they return, they go to church with her family, then return to their new home. Jordan’s family surprises him for his birthday. Dare and Betsy give him his skates. His in-laws give him two pairs of new skates. Astrid shows him his car – from the 1930s and restored with his father – that she had brought to San Majoria. She also used a storage room to create an ice rink of synthetic ice. He could use his skates at the real rink and the new ones here – but since they dull faster, he has an extra. While talking with Dare, Jordan sees Sofia on the beach below. He runs through the palace, knocking the king over. By the time they get to the beach, Sofia is unresponsive. He carries her to the sidewalk where Dare starts CPR. She’s awake by the time the helicopter arrives. They all go to the main hospital on the other island to wait. Sofia will be fine, but an investigation ensues to see how Sofia came to be unsupervised on the beach. The investigation shows that Sofia climbed out of her crib, found a secret passage, and ended up on the beach. The employee who left the door propped open was appalled at his role and reassigned to another location. At the Women in Medicine fundraiser, Jordan tells his story and gives several awards to women studying medicine or doctors – including the neurologist who assured them Sofia would be fine and the doctor who performed his heart transplant. On Christmas morning, Astrid tells Jordan she’s pregnant. They tell the rest of the family.